The fire awareness training course is suitable for all members of staff to ensure they are fully conversant with their fire safety duties within the work place. The objective of each fire awareness training course is to give delegates all round knowledge of what to do in the event of a fire. Every fire awareness course is reinforced with videos and questionnaires to help delegates retain the information. Any further questions on our Fire Awareness Training Course? 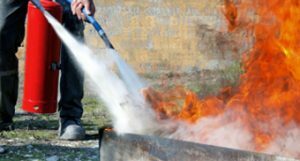 If you would like to find out more about the fire awareness training course, or if you cannot find the fire safety or fire extinguisher training which you are looking for, give us a call on 028 2564 5374. we can create bespoke training tailored to your company’s specific requirements. Please contact us to discuss your needs. You can protect your business for a very reasonable price with Rea Fire Safety. Contact our team for more information on fire training and legislation. Whether you need professional fire safety consultants or reliable safety advice for your company to comply with all relevant safety regulations, choose Rea Fire Safety.